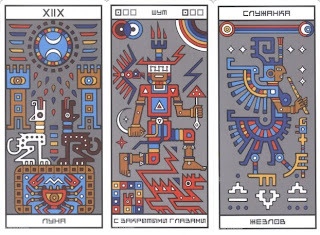 This deck was the first truly Russian deck I ever discovered, although Russian… The artist behind it Anna Nikolaeva and the author of the book Sergey de Rocambole are Ukrainians* and the art is a geometric Mayan/Toltec style. As with so many east-European decks from Russian or the former USSR, the structure is deviating from standard tarot decks, it has 89 cards made up of the majors + 3 extra fools and the minors have 6 person in the court cards, what gives balance in genders namely: a King and Queen, male and female Riders (who correspond to the Knight), and male and female Servants (who correspond to the Page). So despite the unusual number of cards a nicely balanced out whole. Thought provoking innovative in structure yes but with a strong and logic structure it’s is a deck that is both modern and in line with classics, a nice addition to any collection, and for the tarot readers among us something you may try out and see on what strange ways it leads you. The one thing that may hold many persons back are the non-scenic minors, but fear not they are not boring at all, and the decorations and positioning of the suit symbols is very reminiscent of the TdM**. 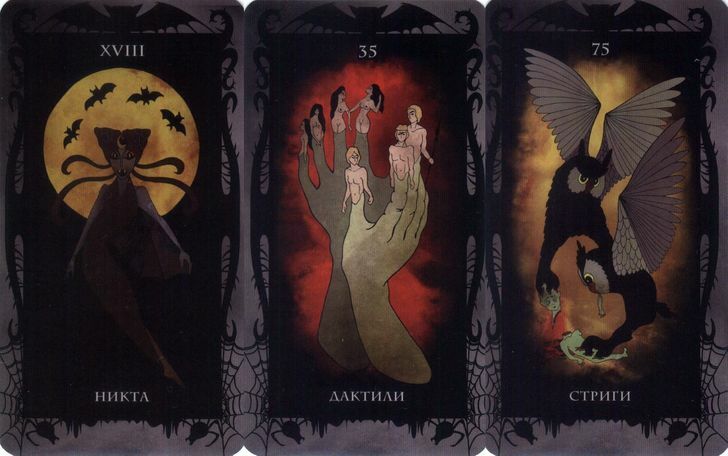 One of these new arrivals is the 'Demons Tarot' by Vera Sklyarov, a very prolific person and big in tarot circles in Russia, who's decks start to fetch high prizes. As one can imagine by its name there are a fair amount of dark images but not in a cheap gruesome way rather surreal strange and captivating. One characteristic of many Russian decks is their strangeness - or rather not fully tarot structured, there are 78 cards divided into 22 majors who are for the most part easily recognizable the problem reside in the 4 suits of each 14 cards, with each suit having its own color (namely red, blue green and yellow) but without any symbol or recognizable court cards with gives the minors more the feeling of being an oracle rather than a tarot. Le Tarot Idéographique Du Kébèk. Each of us had at least once had this; you see a deck, fall in love only to discover its OOP (Out-Of-Print). These last years I found a few places that listed it as in stock so I ordered only to discover they are unable to deliver. So when I found one a few weeks ago at yet another shop I ordered but without much hope (but then you never now was what I was thinking) and YES at last after a hunt of 5 years I found one and even better at a price that seems identical to when it was released. It is a majors-only deck following the Wirth/ Papus systems and inspirited by the Papus deck but with a twist: the images are constructed entirely by lines and non-elliptical arcs, variant curves are created by joining arcs of different size, and shading is created with crosshatched arcs and lines. The artist, Yves Paquin, restricted himself to using only square rule and compass to accomplish this. Highly esoteric decks that are very balanced in their structure convey the system they are based upon and are artistically very nice to look at they exist - proof of it is right here. 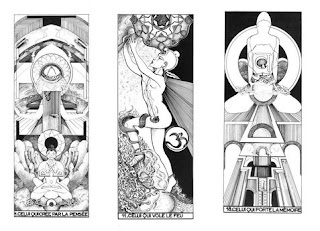 In stunning black and white images with an oriental feeling, lots of Buddha's and Buddha like figures represent the supreme un-namable being as seen through the various archetypes he presents himself to those on the lower planes of existence. This French deck was published in 1979 as 22 oversized (37 x 17 cm) prints with a few pages of information and poetic descriptions of some cards, who have all been renamed to fit the system behind it . 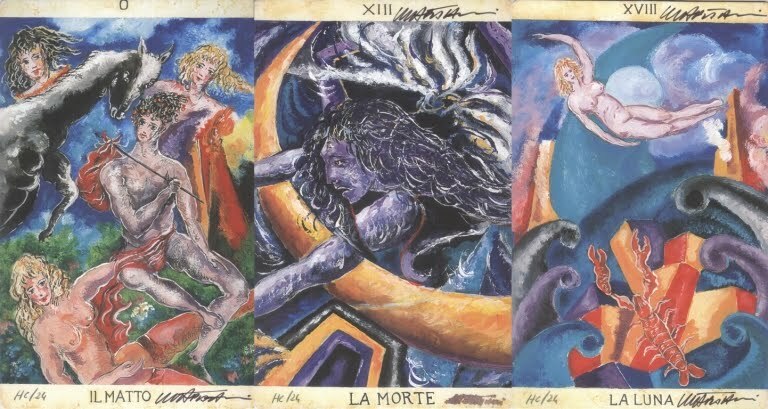 Some 10 years after the first silkscreened and 4 years after the second printed edition of his 'Tarot de la Félicité' came out Pierrick Pinot has now released 2 new decks the 'Le Tarot des Renart' and the 'Le Tarot De Minuit', these last 2 are variations of the first, but what nice variations they are! With his 'Tarot de la Félicité' Mr Pinot tried to go back to the style and feeling of the old Tarot de Marseilles decks like the Jacques Vieville and Nicolas Conver making a synthesis of these but then with a fine art feeling nicely printed on very thick card stock making it a true gem of craftsmanship. 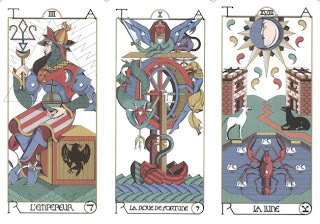 Last month saw the release of 2 new decks that are born out of the Félicité, the first is the 'Le Tarot des Renart' a stripped down and lightened up version, that feels more close to the older Marseilles, with the second Pierrick wanted to create a deck 'as they arise in the imagination of the person who designs, just before they are embodied' the result is a quite psychedelic deck. The artists home page is here but for the moment only the 2 last decks are not yet mentioned in the English version only in the French. It's not only rare or Out-Of-Print decks that get my attention or a place in my collection, and some 'big or mid-seized' publishers also produce interesting decks both on the content as from the artistic point. Schiffer Books is a relatively new player on the tarot market but has already earned a lot of good publicity with their good quality decks and broad spectrum of styles in their catalogue. The Silver Era Tarot is one of their latest publications and despite being a classical Waite-Coleman based deck it has some nice differences with it and more important a real personality. 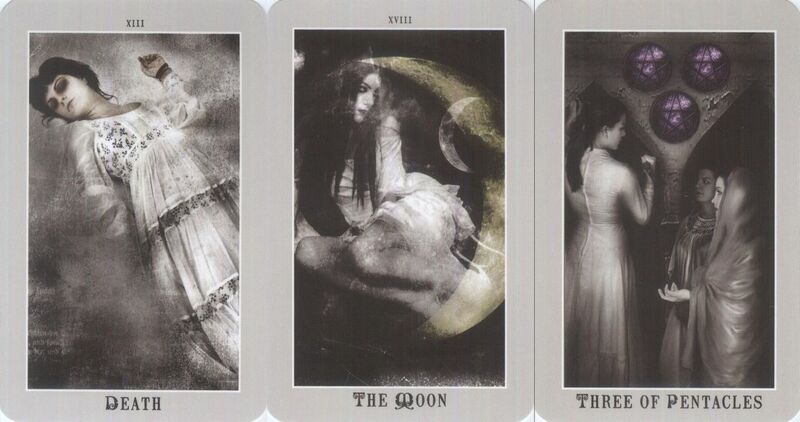 The artist behind the deck Aunia Kahn used black and white photographs with only a bit of color to accentuate elements and details but all with much restraint, giving it an feeling similar to the images from our great grand parents (well if they posed for a tarot deck it would be). The result is both elegant, romantic and gothic. There those decks that can stay for ages on your wanting list, because they are rare, or because they are really expensive and there are those that are both. One of these is this deck, in the last 10 years I only saw one for sale online and it went quite high. So when I discovered end April that the artist released 13 years after the original publication, and after much demand by collectors who contacted him, a limited number of 24 copies from uncut sheets and test prints and made these available exclusively through Alida my collectors heart jumped up in my chest and made my blood pressure soar sky high (what for me is rare) – that much I had to check a few times to see if I saw correctly. I jumped up, grabbed my VISA – stopped to think and ponder off course (this is no small sum of money after all) and finally bought them! And as with all my deck with no regret at all they are sublime, not a readers deck, not for meditation but purely for the die-hard collector and tarot-art lover, but those who count themselves to this last category and can afford it do it, you won’t regret it. They are bold magnificently looking and BIG at 241x154mm and printed on some heavy cardboard.